We have curious minds, enjoy problem solving, searching for evidence and recording clues, asking questions, drawing, and noting observations in our Nature Detective field journals. Nature Detectives activities encourage children to take risks, build confidence, work as a team and have fun while they learn. Sharing stories, playing games & creating nature-inspired art projects. 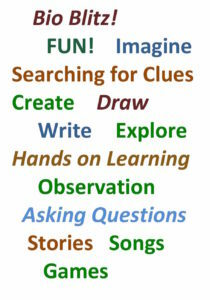 Nature Detectives is more than outdoor fun and games. We engage in “Playful Learning” – activities planned or directed by an adult, with the child controlling their own engagement. We believe nature experiences is a lifestyle choice that inspires health and wellness for all ages! When children engage with the natural world at a young age, the experience is likely to stay with them and shape their future interactions with the environment. Learn more here by reading a feature story describing the value of getting outside. Read the blogs on this website for more ideas! Listen to Janice’s interview in a podcast describing the FUN and inherent value of Nature Detectives.